Sadly, we don’t know much about this little girl. It’s almost as if the past three years of her life didn’t exist. We may not be able to see the internal scars, but during the intake exam, we definitely saw the external scars and permanent damage to her body. Luna had been front paw declawed to try and make her a safe pet. Two of her amputated toes already have bone regrowth protruding from them. But that wasn’t the worst of it. We’d heard her teeth had also been filed. We assumed she would be missing the tips of her canines. But what we found broke our hearts. Her top canines had been cut off just outside of her gum line, while the bottom canines had been cut half way. All four teeth had root pulp exposed. The pain this poor girl must have endured is just unimaginable. When you have to disfigure an animal to try and keep it as a pet, it should be a clear sign the animal is not meant to be that. The little information we have on Luna is her name and that she is approximately 3 years old. We were also told she was purchased by someone who had too much discretionary income and then got bored of her. We know she’s gone through multiple homes, but we don’t know how many or for how long. 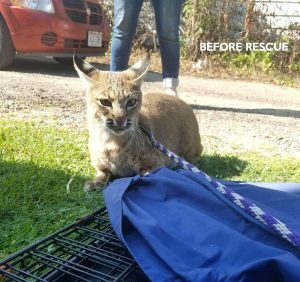 What we do know is Luna is now safe! Luna is at her forever home. A home that will invest in expensive dental surgery to alleviate her pain. A home that will monitor her front paws to make sure they don’t become infected. A home where she will finally get to be a bobcat, living wild at heart. Welcome home dear, Luna. We love you already! If you’d like to become Luna’s sponsor parent (or any of the cats’), it’s such a great way to help, too! LUNA MAKES AN UNEXPECTED FRIEND! For the winter, Luna’s moved into a different area of the sanctuary. She has a large indoor, temperature-controlled room with elevated platforms and hammocks. I didn’t want her to be lonely on her first night there, so was happy to see she liked cuddling up with a stuffed animal in her hammock. She has full access to an outdoor habitat area, too. When we opened up the door to it, I thought she might bond with her new neighbor, bobcat Salem. But I was surprised it was Sebastian, the serval next door, that fell in love with her so quickly! He started talking to her and following her up and down their shared wall. She didn’t seem that interested, but was more excited about exploring her new habitat instead. Sebastian continues to talk to her, hoping to convince her he’s the best thing ever, so we’ll see how this friendship blossoms. 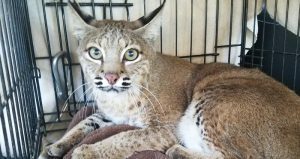 As you probably remember, Luna is our latest bobcat rescue. 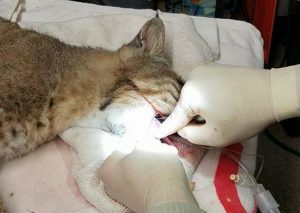 She arrived 4-paw declawed and her canines had been horribly cut off. She’ll be receiving the root canals she needs this week when the Peter Emily International Veterinary Dental Foundation arrives to help. We’ll share more when she undergoes those procedures. Thank you for keeping her in your thoughts. 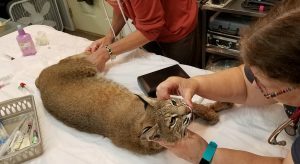 BOBCAT LUNA WILL NOW BE PAIN-FREE! 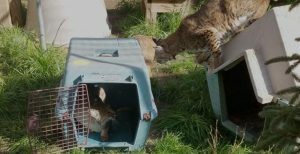 As most of you know, bobcat Luna has gone through a lot in her short 3-year life before coming to The Wildcat Sanctuary. 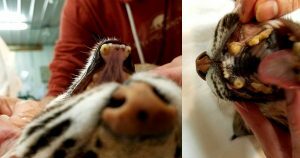 Kept as a pet, she had be declawed and her four canines had been cut off at the gum line. How painful this must have been for her. 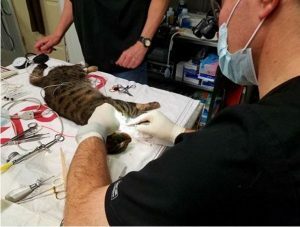 Vets, technicians, and the Peter Emily International Veterinary Dental Foundation generously donated their time to help her and Bengal cats, Tahiti and Max, this weekend. Originally four root canals were planned for Luna. After an examination and radiographs by Dr. Hall, it was determined best to extract the entire roots of the broken canines. Luna will feel much better, and doesn’t need the canines to chew her meat at the Sanctuary. 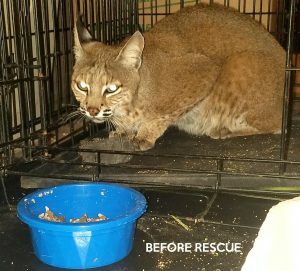 Just a few hours after the procedure, she ate her first meal! We are very excited that she now gets to settle in to life at the sanctuary and live without pain. Thank YOU for making her individualized care possible!